If it’s been six years since your last album or release of any kind, you better blow me away with your new material. This rings especially true for BattleroaR, who have undergone numerous lineup changes in that time frame, and I don’t think I need to discuss the impacts new band members can have. Luckily, I’m delighted to announce that Blood of Legends isn’t the total dud I expected it to be from the Greek epic metallers. Their brand of mid-tempo epic traditional metal (with a violin twist) is as infectious and captivating as ever. One of the most prominent additions to this album isn’t necessarily the new frontman: it’s the new violinist, Alex Papadiamantis, whose inclusion really pushes the music to a much higher echelon that can be heard on the instrumental opener, “Stormgiven”. From then on, his occasional inclusions always remain memorable and melodic, and never do they seem shoehorned in or contrived. Despite the rather long average runtime of the songs, most songs speed by quickly, largely due to the myriad of sounds that are employed. Notably, the songs can run the gamut from folky melodic metal, along the lines of Falconer, to growled and intense passages in “Chivalry”. Even the symphonic exaggerations in “Exile Eternal”, the last real track of the album, are immensely enjoyable and provide a pleasing finish to the album, but the meat of the album has an issue that remains rather prevalent in a lot of these epic metal albums: the band seems to lose any semblance of “power” and the songs start to suffer from redundancy. From “Blood of Legends” to “The Curse of Medea”, the songs take a hit and lose their luster. Autopilot mode is activated for these songs, the intensity and hooks of the previous tracks vanish, and it throws a great album off-track. It’s only lucky that an absolutely fantastic “Valkyries Above Us” manages to salvage the mangled mess of the past few tracks and redirect the band back to their usual form. 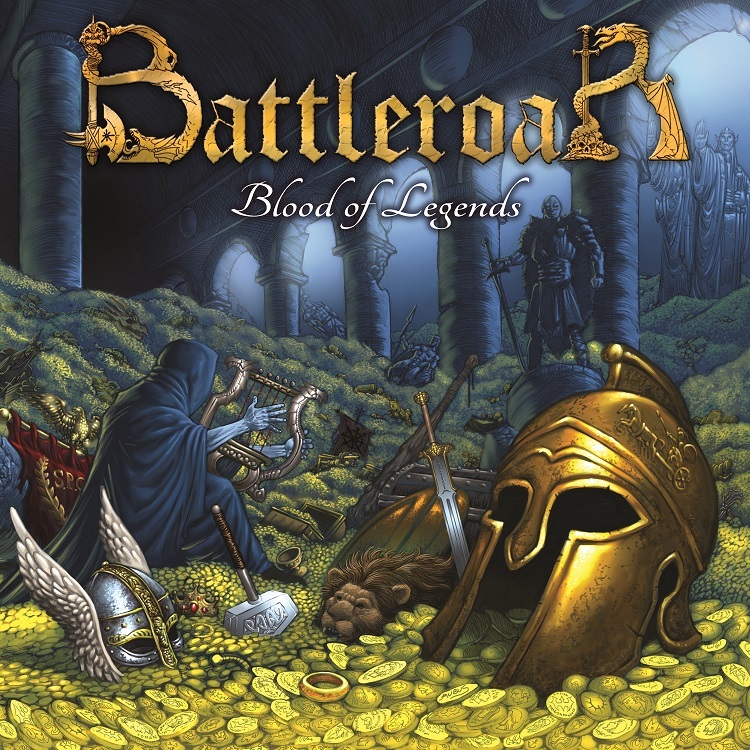 BattleroaR fourth studio album, Blood of Legends, succeeds spectacularly in many places and fails terribly in one isolated area. It’s definitely worth a few play-throughs, if only to familiarize oneself with some of the majestic harmonies and choruses that BattleroaR have conjured up, but there will no doubt be songs that you will find yourself skipping repeatedly. With that said, after an excruciating six year absence, it’s nice to see that BattleroaR are still very much capable of making great music. This entry was posted in Reviews and tagged athens, battleroar, blood, del, druz, Epic, Greece, legends, metal, sur, traditional, violin. Siavash is The Metal Observer's college junior correspondent. Now working as a resident assistant at The University of Texas at Austin, he passes time by unfairly asserting his power over residents, crying over his prospect of finding an internship, and ping-pong. He plans to quit ping-pong soon. Great band with another solid release. Pretty much agree with your assessment. BattleroaR (official) definitely is a band that just needs more exposure and I think their popularity would grow accordingly.